When to go to TURKEY? PATLICAN or as it called 'Aubergine' in England and France, 'Malanzane' in Italy and 'Bademjan' in Iran. Even Turks use this expression that, PATLICAN is used in a wide variety of combination 40 different dishes and salads from famous 'Karniyarik' and 'Hükarbegendi' to PATLICAN TURSUSU(eggplant pickle). Turks eat PATLICAN all summer long and in the winter time PATLICAN TURSUSU(eggplant pickle). You can find at least 2 different kinds of eggplant dishes even if you are in a smallest restaurant anywhere in Turkey. The vegetable is naturally low in calories, good fiber content and has no cholesterol or fat content before cooking. Eggplants contain a slightly bitter liquid. But there is a trick that this can be removed in several ways. The most common is to salt and drain the peeled, cut-up eggplant for at least 3 minutes, then rinse well under cool water and pat dry. Soaking salted and drained eggplant pieces in milk keeps them from absorbing too much oil during frying. The eggplant can be souffle, stuffed, sauteed, fried, boiled, baked, broiled -- and is excellent both hot and cold. Its flavor changes to accommodate the other ingredients with which it is cooked. Turks don't eat eggplant in combination with cheese, either cook it as breaded, like Italians. If eggplant is one of your favorite vegetable too, when you visit Turkey enjoy eating it. Eggplants dishes are available everywhere in Turkey. Cappadocia and the underground cities certainly take a particular place in your memories and in your photograph album. The some of attractions are illuminated but some of them are in dimmed . So, we suggest you take your flash light handy for a better viewing experience. _ _ The landscape is like one would imagine in dreams ! 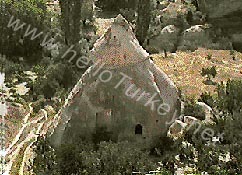 _ _ _ _ www.helloTURKEY.net' s mission is giving you as much detailed assistance before you visit Cappadocia. More words are useless in describing the charm and the beauty of this region. You must experience this for yourself! Cappadocia is located in land of NEVSEHIR province, which is almost in the middle of the Anatolia ('Anadolu', in Turkish) and 218 miles(~350km) southeast of capital city of Ankara. The area is a combination of history and natural land formations and present itself as an open air museum. Cappadocia's pre-history began ten million years ago by violent eruptions of the volcanoes of ERCIYAS and HASAN mountains. The eruptions spread a thick layer made of tuff, clay, sandstone, marl and agglomerate which covered the surrounding in a thickness of more than 32ft (100Mt). Truly there is no other place like this on earth ! - - - - - - - - - - - - - natural phenomena in the world ! The interesting rock formations, known as 'fairy chimneys' have been formed as the result of erosion of this tuff layer, sculpted by wind and flood water, running down on the slopes of the valleys. The colors ranging from warm reds and golds to cool greens and grays. Surface waters formed two rivers , the MELENDIZ and KIZILIRMAK. Wind, frost, and the relentless sun formed the soft layer of soil and small valleys. Some layers were softer than others and water penetrated deeper in the soil, leaving a harder layer on the surface. Signs of human life have been discovered, dating from the bronze age and the Hittite period (3000-1750 BC). Other inhabitants who took over the region are Persians, who named the region 'Kapatuka' (Country of thoroughbred horses). Cave churches and monastic complexes gave a further glimpse into the deep Christian heritage of this area. During 334 -332 BC this land became part of the ROMAN EMPIRE. It is known that St.PAUL was looking for a secure place after being expelled from Jerusalem. He came to Cappadocia and with his followers established the first Christian colony in this region. Then came the the BYZANTINE and finally this important region of Anatolia was conquered in the 11th century by SELJUK TURKS, who were led by their chief ALPARSLAN, and ruling continued true OTTOMANS. NEVSEHIR is the capital of the Cappadocia region and is a perfect starting point to see all areas. Cappadocia attractions include from the 'The Göreme Open Air Museum' which is located approximately 0.6 mile(1 km) from the town of GOREME. Goreme is small town and many people still live in the rock houses. Also many pensions and small hotels have rooms cut into the rocks. This is a very inexpensive type of air-conditioning for the summer months because the temperature stays cool inside the rocks. VISIT CAPPADOCIA SUMMER or WINTER. it is always beautiful!When are you planing your visit, we suggest you take at least 2 or 3 days. The area is pretty large, you can not see it all in just one day! Also, keep in mind that it is too large for going from one area to another on foot. You need to arrange your transportation before the start of each day. Visiting to the towns of AVANOS and the three villages of GOREME, URGUP and UCHISAR are all good bases for anyone exploring in this region. The entire region lies in a large area at an altitude of 4000-5000 ft (1200-1500 meters) and with the many unique formations it is very picturesque. 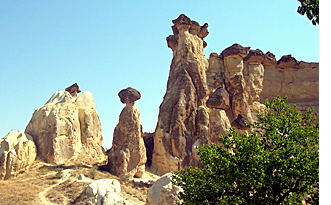 Cappadocia's strange landscape is often reminiscent of another planet. 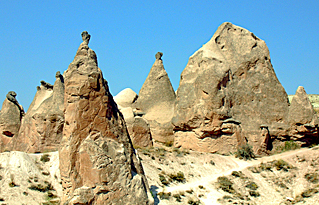 Turkish people refer to Cappadocia as GOREME and/or ÜRGÜP PERI BACALARI (Fairy Chimneys of Urgup). ). In history, during Roman' times the first Christians emigrated to the cities and villages here. They started digging for the first churches and settled in the dwellings made in the rocks. There are many church sites to visit in this area and in all of them the visitor will find that scenes of the life of Jesus are represented. 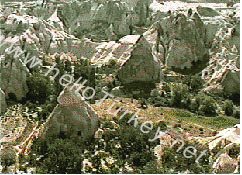 The most interesting sites of the region include 'The Rock Chapels of Göreme', the village of AVCILAR, the red-coned monastic complex of ZELVE, the villages of ORTAHISAR and ÜÇHISAR clustered around rock pinnacles, the canyon of IHLARA and the underground cities of KAYMAKLI, 13mi (20km) south of city of Nevsehir and DERINKUYU (4mi/6km south of Kaymakli). Speaking of underground cities in this area, there are upwards of 200 of them and you will want to see at least some of them when you are in the Cappadocia region. Most of them were built between the 6th and 10th century AD. They formed an underground network where inhabitants could find refuge. Approximately, 15,000 people used to live in each of these underground cities. At first the Hittites developed such underground cities because they knew how to build tunnels in order to trap their enemies and take them by surprise. After the first century A.D. they were used by Christians seeking escape from persecution by the Romans and these underground cities continued to be used as late as the 12th and 13th centuries of the Byzantine period and then later the Selcuk Turks continued to use the network of galleries for military purposes. ~12mi (20km) north of the town of AVANOS is ÖZKONAK, the largest underground city. Underground cities are in the form of several levels(up to 9) and they have been dug very deep (as much as 255ft (85Mt). The first two levels were always in use but the lower levels were used only in times of emergency. Christians would live her for months at a time as they carried on all functions of everyday life. Intricate ventilation systems and water wells made life fairly comfortable under the circumstances. Nearby is the beautiful town of AVANOS only 10 miles (~17km) from NEVSEHIR with its charming old houses. This town is very famous for its handicrafts, especially pottery and onyx. The Red River KIZILIRMAK splits AVANOS in two. Do not miss the opportunity of getting some souvenirs such as pottery and onyx in AVANOS ! Another nearby village is SOGANLI which is picturesque with dozens of chapels, churches, halls, and tombs and is well worth a visit!. Consider a hot air balloon flight over magnificent Cappadocia ! This ranks as one of the grandest treats that any visitor could have. If you love nature and photography, you will revel in doing this. Several companies offer balloon rides from mid April through October. Check into this with a local travel agency or with your hotel. During your balloon flight if you captured a really good photograph please send it us. We like to publish it on this web site and will give you proper credit. If you found this website useful and believe that you know others who may also enjoy this, please pass the word on. Thank you! Would you like to advertise your business in this website? Any time of the year is beautiful to visit this area, either under very strong sun during the summer months or in winter when the ground is covered with a blanket of white. During the summer months this fascinating open-air museum offers a perfect landscape for hikers. When you go hiking, be sure to take plenty of water! Consider wearing a comfortable pair of walking shoes. You have these options: One is using bus service, which you can get yourself easily by bus from anywhere in Turkey and the other one is flying. The main airports of the region are located in KAYSERI and NEVSEHIR, which are close to Cappadocia. The other alternative can be, by taking the nightly Meram Ekspresi, which is a 'pulman' sleeper train, from Istanbul to Konya, and after visiting the historical city Konya for a day or two, taking 3 1/2 hrs. bus ride to Nevsehir. URGUP is the center of a wine producing of this entire region and every year in October an International Wine Festival is held there. This is an excellent time to enjoy yourself in discos and bars at night and meet the local people. The entire area has many stores that offer a variety of fine handcrafts. Urgup is a good shopping place for carpets and kilims too.